An I-told-you-so that with an icky side-effect. It's been more than 4 years (!) since I wrote The future of music playback, wherein I imagined that one possible medium for music in the future would be custom music players (that I called "playbacks"). Basically, the idea was around music player hardware becoming so inexpensive and small that it'd someday become as viable to sell a music fan a whole, physical, mp3 player as it is today to sell her a CD or a collection of mp3 files. So, I just learned about the new Journey Preloaded MP3 Player, which, for about $40 from Wal-Mart gets you a fancy mp3 player sporting Journey-themed artwork and including the new Journey album as well as "11 re-recorded classics." And, yeah, therein lies the icky factor—take your pick: Journey (in general), Wal-Mart, the new Journey album, or the re-recorded classics. Sorry, if you were eating. . . The physical design of Playbacks will be focused on either the symbolic value of an object, or the utility of a user interface, or both. . .
People will collect Playbacks because they are nice, physical, objects to associate with music. . .
People will produce "branded" Playbacks. . . Musicians and artists make some money designing and selling Playbacks to go with specific music. A grueling work-week, from which I am apparently emerging.
. . . [W]e are nostalgic for a time when we believed in the future. People miss the future. There's a yearning for it. Disney does know what people want. People want to feel some connectedness to the future. The way Disney delivers that is to reach back in time a little bit to the past when they did feel connected. It's a bit of a cop-out. . .
Also, on the Long Now site, an interesting blog post about photographer Edward Burtynsky's proposal to print photographs that will last 10,000 years (to go with The 10,000 Year Clock—the one with chimes composed by Brian Eno). Burtynsky has been researching a method called "carbon transfer print" that uses inks made of ground stone.
. . . Burtynsky showed a large carbon transfer print of one of his ultra-high resolution photographs. The color and detail were perfect. Accelerated studies show that the print could hang in someone’s living room for 500 years and show no loss of quality. Kept in the Clock’s mountain in archival conditions it would remain unchanged for 10,000 years. Thinking forward to 10,000 years really is pretty mind-blowing. . .
My long time friend-hero, Barry Smolin conducts a great interview with my long time friend-hero-of-a-friend-hero, Stew. Stew: I learned how to be an artist from Jews. I was already an artist, but I was closeted about it. And I didn't know anything about James Joyce or French film or the Beats. I didn't know how to wave my freak flag. Jews were born carrying theirs. So being an artist was no biggie. The Jews I knew in high school who would unashamedly describe themselves as "artists" blew my mind and changed my life forever. They read the big books and wrestled with the big theories and dove head first into the continuum and they claimed the continuum. They didn't read A Portrait of the Artist as a Young Man as just a novel. It was a manual for them. All art was an instructional manual. As was French film. And it was that way for me too. We weren't observing; Godard was teaching us and we were taking notes on how to live life. Most shockingly, they wrote songs while their moms cooked dinner within earshot. I never could have done this in my home. I was too ashamed of being an artist. I wrote songs in the basement or in the quiet of my room behind a locked door. Just having one of those days—trying to cheer myself up a bit. What should a music player / library look like, given our ability to play music independent of physical recording mediums, and our access to multiple devices, collections and the whole Web of music? We're currently in a transition beyond the physical basis of "albums," and even the "shiny disc" mediums of music. This transition is probably being slowed-up by what I recently called the dogma of the medium, but it's happening. Music is fundamentally an audible medium, but music has always been created and heard in relationship with other contexts and mediums. Originally, you typically would see the musicians playing in front of you. Even with LPs and CDs, we've had album art. And, really, we co-create all of the music we listen to when we choose to play it in a certain context: there is no one Purple Haze, but rather there are every version everyone has ever played, whether it was Jimi playing it or you pushing play on your iPod. Each of our co-creations connected something audible with something else: kinetic, visual, environmental, social, sexual, imaginary, philosophical, etc. Music is relationships: relationships between one song and another, or between the same song in multiple versions, or between any one version of the song and all of the times you've heard it. And, as information, we do make these connections internally, in our thoughts and memories; and externally, in what we communicate both through what we ourselves sing and play on instruments, and in the stories we tell others about music. And, this communication of connections always finds its voice in every medium: magazines, books, radio, TV, movies, and now online as email, IM, web pages and sites. The Err or Man web pages (more coming soon) are going to, first of all, be a communication of connections, from my own perspective. I imagine that these pages should expand over time to include your perspectives as well. We're on the web, and so we can say this pretty simply: we're really just talking about links. Also, a link-oriented model can facilitate many practicalities around music and the people who listen to it. People link to music, and music links to people. This can manifest in transactional terms (tips, payments, etc. ), as well as in creative terms (remixes, evolution from artist to artist). But, unfortunately, our music players are stuck in a physical-medium-model of music. They see the music not as relationships, but as files of just the audio portion of the music. So, for example, right now, the richer experience with Err or Man is going to come from listening to the CD (sound) while looking at the book (art, maps, lyrics). This website will help you experience something like this as well, but its potential could be so much more if our music players worked first of all in terms of web pages and links. Today, Lucas Gonze articulated a Song Page Manifesto that represents practical steps towards creating a new model of the music player and music library, based around web pages. This grew out of his post yesterday on creating a dedicated page for a song, which happens to be the song frog in the well that I posted about recently as well. I am thinking that this all is a significant frontier to venture into . . .
Really great: I Met the Walrus, an animated short based on a 1969 interview with John Lennon. One of my favorite parts of the interview is when Lennon talks about the meaning that people find in music, how it's "all in there - either trivia, or profound whatever," and how he discovers this in retrospect in his own music. Great find: images of the world's first album cover. The post on Undependent has a great summary of the story around the first album cover, and a number of images of the cover and packaging. For the complete history of the album cover and its creator, just hit Wikipedia or pick up a copy of For the Record. Alex Steinwess, a then 23 years old designer, convinced Columbia’s suits to create the first true album cover. Until then, 78s were sold in generic sleeves. There's more in Undependent's post (via Kottke). A great way to enjoy some Raymond Scott: footage from the Raymond Scott Centennial Tribute Concert, March 12, 2008 at Concordia University in Montreal, Canada. These are from the 2005adamo channel on YouTube, which is a fantastic collection of Raymond Scott-related videos. 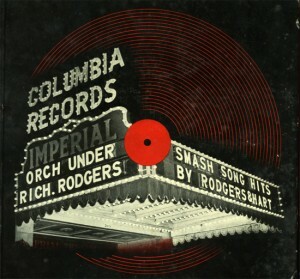 If you don't already own it, I highly recommend this CD of Raymond Scott's music: Reckless Nights & Turkish Twilights. Poking around the Tube a little, I also found this trailer for what could be an interesting documentary, Raymond Scott: On to Something. I've heard that Mothersbaugh is committed to getting the Electronium working again someday, which would be awesome!